The holiday home in Adinkerke, Belgium, is situated in a quiet park with a shared outdoor swimming pool. Plopsaland is 2km away and just a 10-minute drive is the seaside resort De Panne. 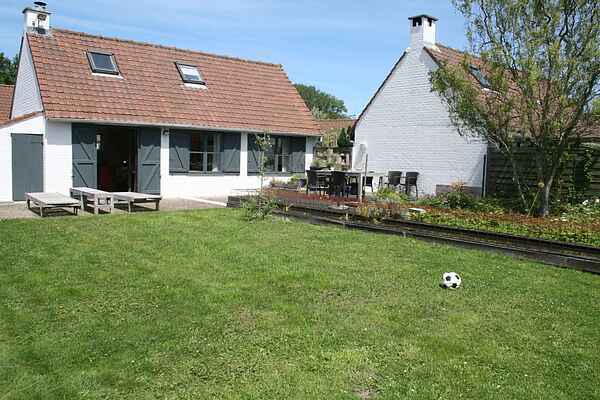 The holiday home has a large garden with lots of privacy and a fireplace. Your holiday home has a cosy sitting area with a fireplace and a dining table for 6 people. There is an open kitchen with all the amenities. You can reach the garden with its cosy terrace via the French doors. Downstairs there is a two-person bedroom as well as the bathroom with shower and toilet. Climbing up a fairly steep staircase, you reach an open bedroom with a double bed as well as a single bed.